Dr. Louis Firmen Barinaga, ninety years old, peacefully joined our Lord on Friday, February 22. Family and friends surrounded him. Born in Twin Falls, Idaho on April 16th, 1928, to Basque immigrants Elena Bilbao and John M. Barinaga, Louis (Louie, Lou) was the third of their four sons including Jack, Nash and Albert. The Barinaga family owned a sheepherding business, and while growing up, Louie worked in the family's operation in the mountains near Cambridge, Idaho. He attended school at St. Joseph's and then St. Teresa's Academy in Boise, Idaho. He delivered telegrams for Western Union during World War II, and worked with the Forest Service in their efforts to eradicate white pine blisters in the summer. Both of these jobs made lasting impressions on him. Upon graduation, Lou enlisted in the U.S. Navy and served his country in 1946 and 1947. He was forever grateful that the GI bill enabled him to attend Creighton Dental School in Omaha, Nebraska, after his attendance at Boise Junior College. He had many memories of his time in Omaha, one of them being the arrival of his Father's band of sheep via railway for the market in Omaha. The sale of the sheep was profitable and Lou vividly remembered his father treating him and his friends to a steak dinner afterwards. The year 1955 was a big one in Lou's life. He graduated from Creighton and returned to Boise to marry his sweetheart Ramona (Mona) Gabiola. Ramona's parents were also Basque and operated a sheep and cattle ranch in the Boise area. Lou repeated often that he was a lucky man, indeed, when Mona said yes. Lou and Ramona settled in Ontario, Oregon, where they made lifetime friends in a simply wonderful community, the fabric of which provided a rich backdrop to raise a family. They were blessed with five daughters in six years, which Mona called Lou's diamonds. Ontario was in easy reach of Boise, and Mona was able to remain close to her birth family. Lou and Mona were strong, busy, supportive parents. Life was never boring in their home. Louie danced through the celebrations and challenges of a feminine household. Lou was always a character, larger than life, and bigger than his small physical stature. He was passionate about his Roman Catholic faith, family, and country. He was dedicated to the profession of dentistry. He continued to study and update his training throughout the years. Though he spent many hours at the office, Lou was always home on time for dinner. He fondly remembered his office staff and their loyalty. Both Lou and Mona were grateful to the Treasure Valley dental patients that provided a good living for their family. 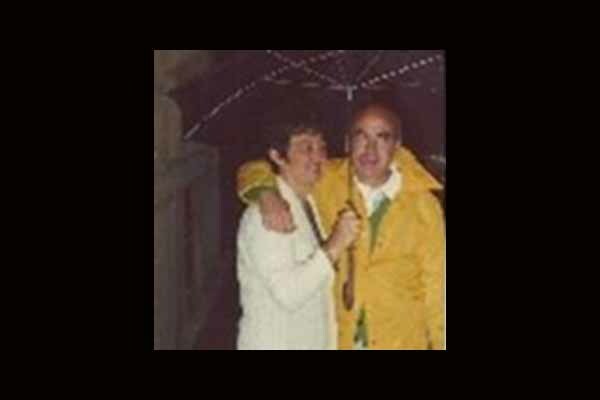 While Mona pursued her interests in pottery, knitting, reading and art, Lou loved to play tennis, ride his bike, hang out with the family, and sit down to Mona's cooking. He traveled many miles with Gustudo, the family border collie. No one could out-eat Louie, though many sons-in-law, and later grandchildren, tried and failed. Later in life, although a misfit in a swimming pool, he learned to swim, and on the insistence of his girls, proudly anchored the Barinaga family relay for the Ontario Swim team. He enjoyed all sports, conversations with salt-of-the-earth people, a good cup of jo, five dollar football bets, Christmas, smoking cigars, and giving advice to his daughters. He always rooted for the underdog and was always enchanted with a clear blue sky. Lou was preceded in death by his parents, his wife Ramona, and his brothers Nash, Jack and Albert. He is survived by his daughters and their spouses: Bettina and Greg Haugen; Casi Barinaga; Monica and Gerry Murray; Leandra and Kent Gambee; Matea and Kevin Flood. His grandchildren Gunnar, Gustaf, Matea, Ments, Hannah, William, Daniel, Andrew, Ignacio, Louis, Elizabeth, Martha, Gabriel and Michaela, and his great-grandchildren Henry and Cassian also survive him. Ramona and Louis loved being Amuma and Achecha. The family is forever grateful to Nurse Terrie and Nurse Becky, the staff of Touchmark in Bend, the congregation of St. Francis of Assisi, and Hospice for the tender care-taking of their father and their Achecha. We will miss you, Daddy. We are at peace in knowing that nothing can ever separate you from the love of our Lord.